Due to be delivered in March 2013, the spacious 34m Curvelle catamaran motor yacht Quaranta will be available for select charter for summer 2013 in the West Mediterranean through David Price at Hill Robinson. 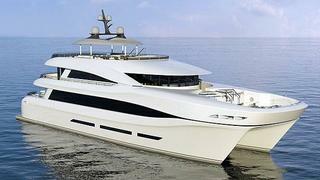 Quaranta has four decks and a nine metre beam. This provides about 50% more guest accommodation space than a comparable 30m monohull. The flexible accommodation layout system means there is a choice of cabin arrangements. The configuration can be changed in a matter of hours. Guests can choose from three spacious suites with double beds or twins, six double or twin cabins, or a combination of suites and cabins. There is wide open deck space on the mid and upper deck plus a large deck space on the main deck including a unique lifting platform/beach that lowers the guests and the tender straight from the main deck into the water. Quaranta charters at weekly rates starting from €145,000 in high season and €125,000 in low season.